Nonfiction books often get praised for how they stack up to fiction. Does it matter to you whether nonfiction reads like a novel? If it does, what gives it that fiction-like feeling? Does it depend on the topic, the writing, the use of certain literary elements and techniques? What are your favorite nonfiction recommendations that read like fiction? And if your nonfiction picks could never be mistaken for novels, what do you love about the differences? Well since I only read nonfiction, I’m not specifically looking for it to read like fiction. But I do love my memoirs which can read like fiction since they are telling a story. Shift Happens by Margot Genger – a story of a woman in the 70s who becomes a truck driver while dealing with mental illness and her journey across the US. Loving Lindsey by Linda Atwell – story of raising a special needs child through to adulthood and the scary parts that go with that. Running With Scissors by Augusten Burroughs – This one is so crazy you will be sure it must be made up but no, it’s true. I was constantly thinking, did he REALLY experience that? Wow. 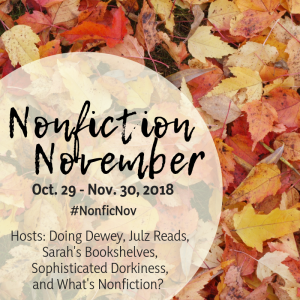 Do you read nonfiction that reads like fiction?